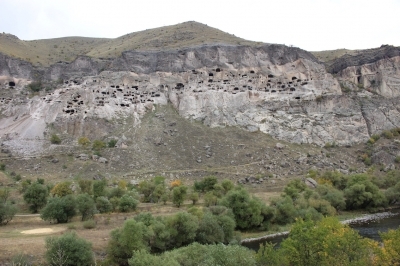 Vardzia-Khertvisi is part of the Tentative list of Georgia in order to qualify for inclusion in the World Heritage List. The history of this site is strange. It is on the TL since 1999 and ICOMOS recommended it’s inscription in 2001, but then was deferred and never re-submitted. Now in 2018, according to agenda.ge it might finally be re-submitted but as two or three different sites: Khertvisi Medieval fortress, Vardzia monastery complex and Oloda monastery complex. Altogether, this area is a vast territory in the upper reaches of the river Mtkvari basin, spread over 18 km from Khertvisi to Vardzia. According to initial ICOMOS evaluation, it is « significant in many respects: unique natural conditions contributing to the specific microclimate and landscape, historical context and diversity of cultural heritage ». It is easier to reach with own car or through a guided tour. It is more than 4 hours drive from either Tbilissi or Kutaisi. On my vist in october 2016, I stayed overnight in Akhaltsikhe to break the trip and habe some more time in the area. Khertvisi Medieval fortress is right on the road to Vardzia, on a high rock above the junction of two rivers. It was erected in the 10th century on the ruins previous forts. Legend says that Alexander the Great visited (or destroyed) the place, and that two of its tower were built by queen Tamar. There is a small parking at the bottom of the hill, with an information table. Walking to the fort takes about 10 minutes. Entrance is free. Walls are well preserved and impressive. The view on the valley is also impressive. There is a small church hanging above the fortress cliff edge. The road between Khertvisi and Vardzia, passes through some impressive gorge, called Tamar’s Gates, doted with old fortresses. There are several small monasteries, one of which is Vanis Kvabebi, built in the 8the century, hanging in the high cliffs above the valley, is well sign-posted and reached by a very steep road. It is still an active cave monastery. Vardzia monastery complex is an impressive town carved out of the mountain cliff in the 12th century, but the area was inhabited since the Bronze Age. It doubles as a fortress. The complex is 500 m long, and contains about 600 rooms on 13 levels. They serve as houses, churches, meeting halls, wine cellars, horse stable or pharmacy, connected by tunnels, holes and bridges and secret passages. Iconic Queen Tamar of Georgia was born here. Tamar is omnipresent in Gerogia, as she represents the golden age of Gerogian history, with political and military expension, as well as commercial and cultural upheaval in the 12the century. Her portrait, painted in 1184-1185, adores the church of the Dormition, the central component of Vardzia complex and is considered as a masterpiece of medieval painting. Entrance to the complex costs a few laris. We are free to explore the complex, and to discover the labyrinth of rooms and tunnels. There is safety railing all around, and at the time of my visit, there were arranging the path to the church to be accessible for handicapped visitors. Oloda monastery complex is located about 10 km to the east of Vardzia, on the Turkish border. I did not visit it, as it was not mentionned anywhere in 2016. There is still not much information available now about this chruch. On google maps, it seems there is a dirt road leaving from Vardzia. Bureau 2001: ICOMOS recommended inscription, "subject to a favourable expert mission report"